Add to your jacket this cool Covert Genesis sew on mission patch. SKU: PATCH01. Category: Mission Patch. Tag: mission patch. 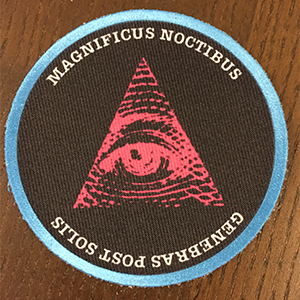 This mission patch is for Covert Genesis. The patch is a sew on patch that can be added to any clothing. Colours are purple and Cyan and White. There are Latin phases on the top and bottom of the patch. The all seeing eye is ever present. This is a sew on patch extracted from dead agents jackets.